Mindfulness – or learning how to focus your attention on the present moment – is a big buzz phenomenon among adults and even school-aged children. But did you know that children as young as three can be taught mindfulness techniques? 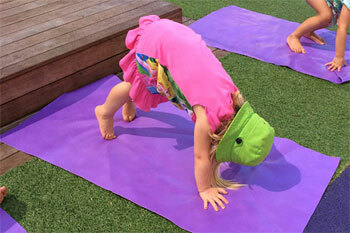 Karma Kids Yoga instructor and founder Beth Borowsky, who conducts a yoga program for preschoolers through Greenwood Early Education Centres in NSW, says even she is amazed by the instant benefits. 'Having taught children yoga for 12 years, I am constantly humbled and heartened by their abilities to get quiet and focus their attention on their breath and body movements," she says. 'It may just be for a minute or 90 seconds, but the calm attention is profound, and lays the foundations for being more in touch with how their body feels. It allows for deeper sensorial experiences (using their senses to explore), understanding more about how they feel emotionally and, as importantly, how others feel." Ms Borowsky says cultivating empathy and compassion from such a young age gives kids the social and emotional tools to support their learning and to manage their stress, making them more rounded individuals who are willing to care and share as they learn to read and write, play and explore. 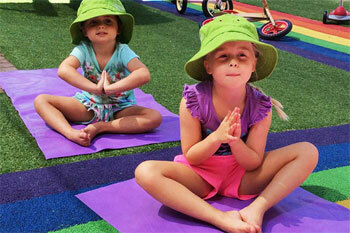 Bringing mindfulness into children's lives is something Ms Borowsky does with the children at Greenwood Early Learning Centres during their yoga sessions. In the two years that Beth and her team have taught yoga to the children at Greenwood, Beth has also trained more than 100 Greenwood educators in one-day workshops designed to equip them with the skills and ideas to weave aspects of yoga into the daily curriculum. Now, Greenwood is a driving force behind a fundraiser for Karma Kids to take their yoga program to the children of the Rainbow Ridge Orphanage in Tanzania. 'At Greenwood everything we do is motivated by the underpinning philosophy that children deserve the best for themselves and each other. Our children are lucky enough to reap the benefits of yoga and meditation, so we jumped at the opportunity to share these benefits with the children in Tanzania," Laura Grainger, Centre leader at Frenchs Forest, Greenwood. Lie your child down on their back somewhere comfortable – bed, couch, in the garden. Place their favourite soft toy (like a beanie baby) on their belly. Invite them to breathe in through their nose for a count of three, and out for a count of three. Watching how their toy rises as they inhale and falls as they exhale. You can increase the count to five or six with practice. Start with just five deep breaths and slowly build to 10 or more. Let your child choose their favourite food and have them eat it really really slowly, being mindful to notice the taste, the texture, the colour, or the temperature.